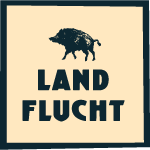 The Landflucht Open Air takes place in Kleinbuckow 1, in 03130 Spremberg. Kleinbuckow is a hamlet of Spremberg and is located to the north of it. At the junction road L 52, between the B 97 approx. At the dam reservoir Spremberg and the B 169 approx. At the height of the town Drebkau. The nearest motorway connections are the A 15 (Berlin-Cottbus) exit Cottbus Süd and the A13 (Berlin-Dresden) exit Großräschen.